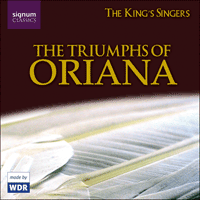 The Triumphs of Oriana is an extravagant musical compliment paid to Elizabeth I by Thomas Morley, Gentleman of the Chapel Royal. Published in 1601, it consists of 25 madrigals by 23 different composers. Each madrigal, moreover, concludes with the refrain, ‘Then sang the shepherds and nymphs of Diana: Long live fair Oriana’. The compliment would have been immediately apparent. Elizabeth had long been equated with Oriana, the heroine of the chivalric romance Amadis de Gaul. It was also fitting that the nymphs of Diana, goddess of chastity, should attend on Elizabeth, the Virgin Queen. The idealised, pastoral setting presents Elizabeth as the eternally beautiful Queen presiding over Arcadia, the justly revered ruler of an idyllic land. But the Triumphs is much more than a piece of passing flattery. Many of the madrigals are excellent, and those by Bennet, Weekles, Cavendish and Morley are well known. Others languish in a possibly justified obscurity. But the collection as a whole captured the musical imagination of the time and continues to intrigue. Where did the idea of such a collection come from? Why was the set not dedicated to Elizabeth? Who is the mysterious ‘Bonny-boots’? And why are so many composers so obscure? Just as the Triumphs continue to inspire imitations, it was itself inspired by a madrigal collection published in Venice in 1592, Il Trionfo di Dori. Commissioned for the wedding of Leonardo Sanudo, a Venetian nobleman, the set consisted of 29 madrigals by 29 different composers, all of which ended ‘Viva la bella Dori’, in honour of the bride. Nicholas Yonge, a singing man from St Paul’s, translated the contribution by Giovanni Croce, ‘Ove tra l’herb’ ei fiori’, and included it in his second anthology of Italian madrigals, the Musica Transalpina of 1597. Morley’s own contribution to the Triumphs, ‘Hard by a Crystal Fountain’, also took its inspiration from Croce: it is an imaginative rewrite of Croce’s music to Yonge’s words. Morley was not, however, the first to think of using this refrain. Michael Cavendish included it in the beautifully delicate ‘Come gentle swains’, published in 1598, and John Holmes’ contribution, ‘Thus Bonny-boots’, was written in 1597. Morley did not instigate the idea of ‘Oriana’ madrigals but took those which were already in circulation and commissioned several more to create the collection. The Triumphs may have been written for an actual pageant or masque performed in front of the Queen herself. A commonly repeated possibility is that they were written for the May Day celebrations at the house of William Cornwallis at Highgate. The Triumphs, however, were printed at some point between July and December. Thomas Hunt, described in the copy as ‘Batcheler of Musick’, only took his degree from Corpus Christi College, Cambridge, on the 4th July 1601, while in December of that year the Cornwallis family accounts show the purchase, for ‘four shillings and sixpence, of Morley’s Orianas in six parts’. If the set really was written for a particular performance, the Accession Day celebrations on November 17th seem a more likely occasion. However, the set was not carefully ordered for performance. The madrigals do not form a narrative sequence, but are arranged for the convenience of the printer. The 5-part songs are printed together before those in 6-parts, and even within each section the order is determined by clef and key signature. One madrigal, by Michael East, arrives so late that it was printed not in the body of each part-book but in the preliminary pages (which, peculiarly, were always printed last). Another madrigal by Bateson was not included in the set at all (and does appear on this recording), but it was printed in Bateson’s own set of 1604 with the admission, “This song should have been printed in the set of Orianas”. Morley, along with Ellis Gibbons (elder brother of Orlando), compensated for these omissions by each writing an extra madrigal in addition to the ones they had already contributed. Morley reworked ‘Adieu you kind and cruel’, which he had already published in 1597, and transformed it into, ‘Arise, awake’. The haste of the reworking is apparent. Unusually for Morley, the words and music do not always sit comfortably together. Gibbons too seems not to have had time to find a new lyric. The test of his first madrigal is identical to that set by Thomas Hunt, although a new first line was added so that the lyric would appear to be different on the title page. Similarly, Kirbye originally wrote his madrigal to the same text as that set by Norcombe, ‘With angel’s face’. To avoid repetition, for the first edition Morley changed the text of Kirbye’s madrigal to ‘Bright Phoebus’, the text performed on this recording. The Triumphs, far from being carefully planned for a performance, were completed in haste. The collection needed to be finished with whatever madrigals were to hand, probably in order to be presented as a gift. In 1598, Elizabeth had granted Morley a monopoly to print music. It seems likely that Morley was attempting to repay this generosity by presenting the Queen with a present of printed music books composed in her honour. However Morley dedicated The Triumphs of Oriana not to the Queen herself, but to her cousin, Charles Howard, Earl of Nottingham. The reason for this was financial. Dedications were a polite way of asking for money, and Morley could scarcely ask Elizabeth for further favours. Elizabeth in any case was notoriously parsimonious. Howard, moreover, was caught. He could scarcely refuse to pay the patron, as any refusal could be interpreted as a slight on Elizabeth. By dedicating the set to Howard, Morley could hope for further rewards and still repay his debt to the Queen. Elizabeth’s presence permeates the collection, but another, less obvious figure haunts The Triumphs of Oriana: references to ‘Bonny-boots’ appear in two madrigals. The piece by Edward Johnson, placed last as was customary for memorial pieces, laments the death of bonny-boots in a sombre tone more akin to a motet than a madrigal. Both William Holborne and Thomas Morley had printed music lamenting his death as early as 1597. The madrigal by John Holmes, in which Bonny-boots is very much alive, was therefore also written by 1597, and is probably the earliest piece in the Triumphs. The text of the madrigals suggests that Bonny-boots was a musical, terpsichorean courtier, a favourite of Elizabeth who died in 1597. Explanations as to his true identity are numerous. One suggestion is that Bonny-boots is a corruption of the French, ‘bon et beau’, and that it refers to a generic courtier. Another is that he is the minor poet, Christopher Morley (possibly the brother of Thomas Morley). Certainly, there is a sonnet by one ‘Ch. M.’ (only extant in the manuscript) which begins with ‘Come blessed bird’—exactly the same words as open Edward Johnson’s madrigal of the Triumphs which laments Bonny-boots’ death. Johnson’s madrigal also capitalises ‘Byrd’, so that it can also be seen was a plea to William Byrd, then in semi-retirement in Essex, to return to court. The most likely explanation however is that Bonny-boots was Henry Noel, a figure much loved by musicians—Weelkes, Dowland and Morley all wrote him elegies. Bonny-boots was a figure at court, where Italian madrigals were very much in vogue. The two ‘Bonny-boots’ madrigals, together with some of the better madrigals such as ‘All creatures now’ by Bennet, copy the 7 and 11 syllable lines of Italian madrigal verse. The refrain itself, of course, consists of one line of 11, and one of 7 syllables. Morley, however, was trying to demonstrate that English music could rival anything produced on the continent. The Triumphs deliberately draws on an Italian model, as Morley drew on Croce’s madrigal for his own contribution, in order that a direct comparison could be drawn between the English and Italian versions—and Morley intended that the comparison would reflect favourably on England. Certainly, the composers of the Triumphs use word-painting in the Italianate manner to great effect. Thomas Weelkes takes the tendency to extremes in ‘A Vesta was from Latmos hill descending’: the music on ‘ascending’ and ‘descending’ rises and falls appropriately, he sets the words ‘two by two’, ‘three by three’ and ‘all alone’ to the appropriate number of voices and gives the bass the word ‘long’ to the old ‘long’ note value. Most of the composers similarly cannot resist the obvious play on words on the ‘long’ of ‘Long live fair Oriana’. In search of the best music, Morley drew upon England’s richest source of musicians, the organists and singing men of the chapels and cathedrals. Although many of the composers now seem obscure, in the 17th century the list of contributors to the Triumphs would have read like a list of the great and the good of English church music. Michael East was organist of Lichfield Cathedral, John Mundy organist of St George’s Windsor, and Cobbold organist at Norwich where Carlton was master of the choristers. Tomkins was at Worcester, while Weelkes was at Winchester then Chichester. Nicolson was organist of Christ Church Cathedral, Oxford and Marson was organist and master of the choristers at Canterbury, where Thomas Hunt was also a singing man. Bateson was organist of Chester, Hilton was at Trinity College, Cambridge, ad Ellis Gibbons came from a family of Cambridge waits and was organist of Salisbury Cathedral. John Holmes succeeded Ellis Gibbons at Salisbury in 1602 having previously been at Winchester, and John Farmer was technically the organist of Christ Church Cathedral, Dublin, although he had more or less deserted his post after 1599. Of the others, most were highly respected musicians. Daniel Norcombe was lutenist to Christian IV of Denmark. Kirbye, Wilbye and Johnson were employed in private houses around East Anglia, part of the extensive network of musical households in which William Byrd also participated. Robert Jones has graduated Bachelor of Music from Oxford in 1597, Bennet had contributed to Barley’s Psalter in 1596, and Cavendish had published his own set of music in 1598. Only John Milton, the father of the poet, seemed to have no obvious musical connections, and was earning his living in London as a scrivener. The only composer who remains truly unknown is John Lisley. It has been suggested that he is John Lyly the dramatist, especially as two of the lyrics in the collection, those set by East and Milton, are ascribed to the initials, ‘I.L’. One ‘John Lillie of the Cittie of London’ is also found in company with ‘Thomas Thomkins’ in the records of Christmas revels at Gray’s Inn in 1594. It is tempting to conclude that Lisley was a London minstrel—his madrigal is certainly not particularly distinguished. Despite all the private references, missing madrigals and complex dedications, Morley created a fine collection of madrigals whose appeal makes them instantly accessible. Though founded on an Italian model, Morley uses the Triumphs to demonstrate the vitality of English music and praise the inspiration behind England’s cultural renaissance, Elizabeth I. The Triumphs of Oriana is an Elizabethan curiosity, the swan song of an age in which Elizabeth, as Oriana, remained the eternally bountiful Queen of a pastoral Arcadia. Published by Thomas Morley in 1601, the 25 madrigals could be the music for a court entertainment, a masque in which Elizabeth was crowned the Virgin Queen to the music of the nymphs of the goddess Diana. But by the time the madrigals were printed in 1601, the refrain ‘Long Live fair Oriana’ must have been sung more in pious hope than realistic expectation. Elizabeth was nearing 70, in poor health and worse spirits. Her favourite, the Earl of Essex, had been executed for treason, Parliament was challenging her prerogatives, and her beauty was preserved only in portraits. Thomas Morley, a gentleman of the Chapel Royal, tried to revive her by repaying a debt, and repaying it in extravagant style. Three years earlier, Elizabeth had granted Morley a monopoly to print music. In return he set out not only to charm her and flatter her person, but to add to the lustre of her reign. Music in England had long been overshadowed by music on the continent. Morley aimed to demonstrate that English musicians could match Italian ones by imitating Il Trionfo di Dori, an elaborate collection of 29 madrigals by 29 different composers published in 1592 in praise of a Venetian bride. Morley’s aim was ambitious and he very nearly succeeded. The 23 composers of the Triumphs are a combination of the young and enthusiastic, the old and the staid, and truly famous and the nearly famous—John Milton, father of the poet, was a contributor. Together they produced a fine collection of madrigals which demonstrated the assured talents of English composers. The words of the Triumphs depicted an idealised England which never existed, but their music reflected the rising cultural confidence of the Elizabethan age: whatever other nations did, England could match or excel.